Iconic entertainer Don Ho, who was just one of many celebrities who turned out yesterday to buy units in the planned Trump International Hotel and Tower at Waikiki Beach Walk, had few qualms about investing in the project. "I would have bought out the entire 23rd floor, but someone beat me to it," said Ho, who purchased two one-bedroom units in the $350 million-plus luxury condominium. 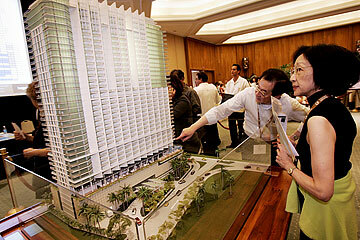 "This project will bring some new faces and new attitudes to Waikiki. It adds a little sizzle." The Trump International Hotel and Tower, to be on the corner of Kalia and Saratoga roads across from Fort DeRussy Park, will become the cornerstone of Outrigger Enterprises' massive Waikiki Beach Walk redevelopment. "Trump Tower Waikiki will be the most luxurious development in one of the most recognized resort destinations in the world today," Trump said in a statement. Trump is partnering in the project with investment firm Irongate Capital Partners. 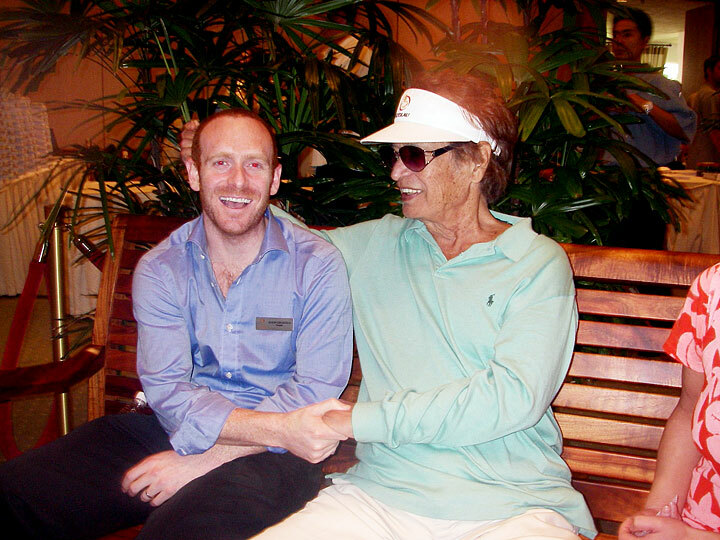 The project has garnered global attention from NBA players, celebrities, top executives, wealthy second-home buyers and investors, said Jason Grosfeld, who co-founded Irongate and brought Trump to the Waikiki project. "Since the project was announced earlier this year, we've been getting two to three calls a week from people who want to get to the front of the line. No matter how famous, we've told them that they have to pick their unit fairly," Grosfeld said. Demand for units has so exceeded the supply that Grosfeld said he sighed with relief earlier yesterday when Ivanka Trump, Donald's daughter, phoned in the unit that she wanted and was actually able to get it. Qualified buyers from Japan, China, Korea, Australia, Europe, Canada, Mexico, Hawaii and the mainland joined Ho yesterday to select units in Oahu's first five-star hotel to be developed since the 1980s, said Peter Dupois, chief executive officer of Vancouver, Canada-based S&P Destination Properties, the tower's marketing firm. The project, which is Donald Trump's first in Hawaii, drew 1,000 reservations from prospective buyers who paid $20,000 to reserve space in the 464-unit project, Dupois said. "We've never seen anything like this," said Dupois, whose company has sold 17,000 condominiums and home suites and closed $4.5 billion in sales since 1990. Dupois and co-founder Sid Landolt of S&P also have ties to two luxury communities on the Big Island. Trump's Waikiki tower, which was sold simultaneously in Hawaii and Tokyo using a proprietary online sales selection process, could set an industry record for the amount of residential property sold in one development on a single day, Dupois said. "The $700 million sale could be the biggest one-day sale in residential real estate history," Dupois said. "We expect 80 percent or more of the units to be sold today -- that's really rare in this business." About 20 percent of the total reservations came from Japan, even though hotel-condominium properties are relatively new in Japan, according to a press release from Pac Rim Marketing. Intense interest in Asia led S&P to arrange the same-day sale in Tokyo, Landolt said. "We're getting calls from celebrities and real estate connoisseurs from around the world," he said. "They know what they want and they want the best." Entry into Trump's project does not come cheap. Buyers will pay an average of $1.5 million, with suites priced from the mid-$400,000s for studios to more than $9 million for three-bedroom penthouses. "There is enormous demand for the penthouses relative to the number of units that we have," Dupois said. Priscilla Florentes, a real estate agent from Fremont, Calif., said that given the allure of a Trump project, she would be satisfied with just a one-bedroom unit. "The name adds value," she said. The unit Florentes had selected was gone before her 12:30 p.m. appointment, but she said she was still hopeful that her backup choice would be available. "I think I've got a chance," Florentes said as she frantically eyed the sales board, watching units disappear.